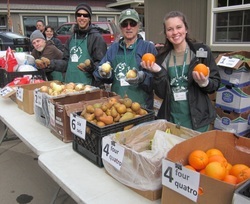 Community members can attend any one of our 4 weekly food distributions in the North Lake Tahoe/Truckee region. We distribute nearly 4,700 pounds of food weekly, 20,500 pounds of food monthly and 246,500 pounds of food annually. This equates to a distribution of nearly 3,950 meals weekly, 17,125 meals monthly, and 205,500 meals annually. For a list of locations and times, see Weekly Food Distributions. FACE is our home food delivery program for individuals who cannot make it to our weekly food distributions due to mental or physical limitations. For a list of eligibility requirements, see Food and Companionship Exchange (FACE). A limited number of bags of non-perishables are available for those who need a little extra food. For a list of bag locations, see Emergency and Cooking Compromised Food Bags. Each year, Project MANA helps hundreds of local families have a happy, healthy Thanksgiving through the Let's Talk Turkey Food Distribution. For more information, see Let's Talk Turkey.